President Bush tells Guard members he is proud of his service. 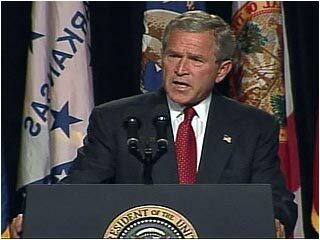 WASHINGTON (CNN) -- The growing controversy over President Bush's National Guard records, and whether some of the memos aired on CBS were fake, took another turn Wednesday night. CBS News reported that the documents it first broadcast last week on "60 Minutes II" appear to be forgeries to the woman who would have typed the original memos in 1972 and 1973. But Marian Carr Knox, a former Texas Air National Guard secretary, said she did type similar documents for her boss, Lt. Col. Jerry Killian. "I know that I didn't type them. However, the information in those is correct," Knox told CBS anchor Dan Rather. Knox, 86, had previously told the same story to the Dallas Morning News in a report that was published Wednesday morning. The newspaper said Knox "spoke with precise recollection about dates, people and events." She told the Morning News, "I remember very vividly when Bush was there and all the yak-yak that was going on about it." In the memos, the author complained he was being pressured to "sugar coat" the future president's performance evaluations and that Bush failed to meet performance standards, including getting a required physical exam. The author also wrote that Bush -- whose father was a Texas congressman at the time -- was "talking to someone upstairs" to get permission to transfer to the Alabama National Guard to work on a Senate campaign. The legitimacy of the memos came under fire almost immediately as people posted doubts on a conservative Internet bulletin board. Soon, a number of document experts suggested the memos were not written on a typewriter in the 1970s but generated on a computer at a later date. Both Killian's former wife and son also questioned their authenticity. Rather defended his reporting on air Wednesday saying the controversy that followed last week's report did not challenge the "heart" of the story. He said that a body of reporting, not just the memos in question, show the future president received preferential treatment to get into the Texas Air National Guard and then failed to fulfill his obligations while an airman. Bush received an honorable discharge, which has not been in dispute. Knox told Rather that Killian was "upset" that Bush did not obey his order to have a physical, and she said the young lieutenant showed disregard for the rules to a degree that irritated other pilots. Knox said the information about Bush in the memos was familiar and that she had typed documents for Killian with similar complaints. She also said the colonel did keep private "cover your back" files. But, she said she did not type the memos that were aired by CBS because they were written in a format she didn't use and there was Army terminology not used in the Air National Guard. Knox suggested that the memos obtained by CBS News might have been recreations made by someone who had seen the other documents, although she conceded that was "supposition" on her part. Earlier on Wednesday, CBS News President Andrew Heyward said the network "would not have put the report on the air if we did not believe in every aspect of it." However, he also said CBS News would try to resolve "unresolved issues" related to the report. "Enough questions have been raised that we're going to redouble our efforts to answer those questions," Heyward said. The response followed intense criticism from Republicans. House Majority Whip Roy Blunt, R-Missouri, said he collected signatures from 39 colleagues on a letter sent to the network calling for a retraction and asking CBS News to reveal the source of the documents. "Clearly, their sources aren't what they need to be, or they're not willing to reveal even the nature of who their sources are," Blunt said. "It's hard for me to believe ... that CBS, an organization with a long and distinguished history in journalism in the past, would be willing to stand by this story when virtually everybody else has questions about it." White House press secretary Scott McClellan said, "The one thing that is not under question is the timing of these orchestrated attacks by the Democrats on the president's service." "And these are old, recycled attacks," McClellan added. "The Democrats have made it clear that they intend to try to tear down the president and throw the kitchen sink at us because they can't run on John Kerry's record and because they see him falling behind in the polls." CNN correspondent Jeanne Meserve and producers Ted Barrett, Peter Ornstein and Sarah Irwin contributed to this report.